Downtown Las Vegas is a vibrant area full of art and culture that speaks to both a great past and promising future. 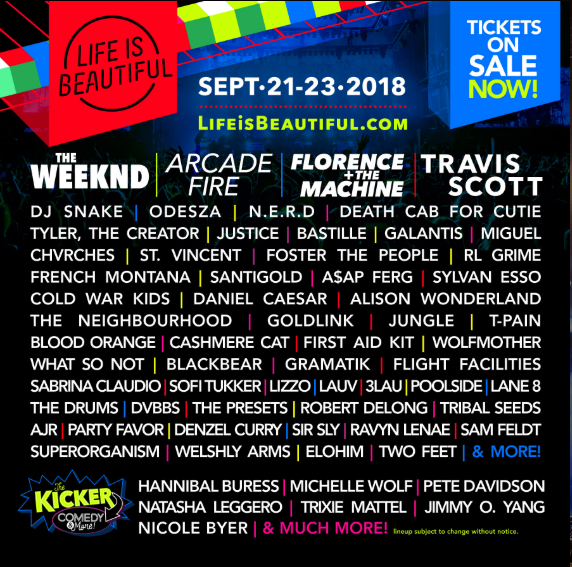 The Life is Beautiful festival, which returns to Downtown Las Vegas on Friday, September 21st, and runs through Sunday, September 23rd, is a testament to this unique culture. The festival will bring some of today’s most celebrated musicians, chefs, artists, comedians and speakers to the downtown art district for a three-day inspirational social platform and celebration of life.The Plaza Hotel and Casino has been an integral part of Downtown Las Vegas throughout its historic past. Today, as the area continues to undergo substantial change and growth, we continue to create the perfect combination of comfort and sophistication while providing an old-school Vegas feel paired with modernism.The effort put forth by the Life is Beautiful team is something we admire, and as a fellow Downtown Las Vegas business, we certainly appreciate the buzz it creates for our community and downtown culture. Adjacent to the arts district, The Plaza has been a hub for those who have attended previous Life is Beautiful festivals and will continue to be one this year as well.Whether you need a room to rest between days of the festival, something to eat and drink, or just some help with directions, we are here to help make your Life is Beautiful experience as enjoyable and empowering as possible. There are three free re-entries per day for all general admission festival guests, so come to enjoy a meal and drink with us at one of our many restaurants and bars and sit back and rest your feet.The Plaza Hotel and Casino will also offer event parking for the festival at a competitive price. If you’re looking to relax during the day before the festival we will host a Life Is Beautiful pool party at The Plaza on Saturday and Sunday starting at 11 a.m. with music, dancing, and drinks. The Plaza is an official hotel partner of the Life Is Beautiful festival and festival goers. There will be around 80 artists playing at Life is Beautiful. With headliners like The Weeknd, Arcade Fire, Florence and The Machine, Travis Scott and many more, there’s no doubt the festival will be packed with good vibes. There are four stages where you and your group can enjoy the music, including one stage that is a dome with an electronic feel where most DJs will play. The first shows on the lineup will start around 3 p.m. and headliners will close out the festival around 11 p.m. or midnight. The festival provides music lovers with a variety of genres, and you’ll find everything from rap and hip hop to EDM and alternative. Life is Beautiful is a celebration of art and culture. There will be modern art exhibits, walk through art exhibitions like the “Art Motel,” and traditional art exhibits with photography and paintings. Art cars, which take festival-goers to and from different stages, will be back in 2018 providing people with the opportunity to experience the marvels of light, sound, color, and technology all working together seamlessly in one art piece. The whole festival can be thought of as a work of art, providing an opportunity at every corner to enthrall the senses of festival attendees. Outside festival grounds in the Downtown Las Vegas community there is also plenty of art to be seen. The Plaza Hotel & Casino is adorned with murals by street artists Shepard Fairey and D*Face that scale the whole building from top to bottom. These murals were some of the most challenging murals they’ve ever created. 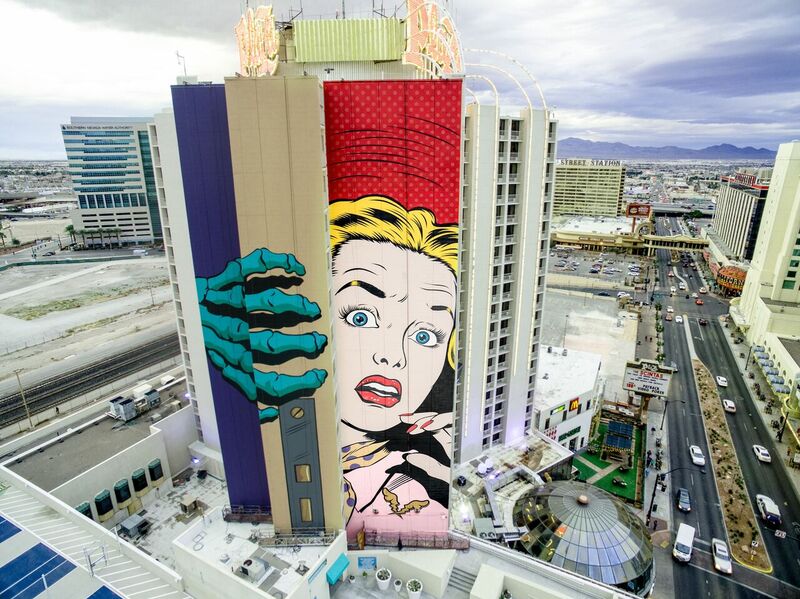 Each artist had to overcome personal and unexpected challenges like changing weather patterns.Using scaffolding and the natural curvature of the Plaza Hotel, each artist transformed a side of the hotel into a living piece of art.Both murals will add color and life to an already vibrant downtown Las Vegas and Fremont Street Experience. Come to see the murals today for yourself and explore the rest of the art downtown. Over 40 eateries with a variety of cuisine will be present at Life Is Beautiful 2018. Attendees can enjoy food from different cultures such as Mexico, Asia, and India among others. There will be many places for festival goers to enjoy food and learn about the art of cooking. If you’re looking for a bite to eat after the festival, you can come over to The Plaza to grab a late night bite at Pop Up Pizza or Brightside Breakfast & Burgers, which will even have a DJ for your entertainment. For those over the age of 21, there are plenty of excellent alcoholic drink options. Drinks will be available from specific alcohol vendors as well as at full-service bars. There are also plenty of bars to enjoy outside festival grounds in the downtown Las Vegas area. Come and join us for a drink at The Plaza where we will have drink specials for festival goers.We look forward to seeing you at The Plaza in September to celebrate Life Is Beautiful!